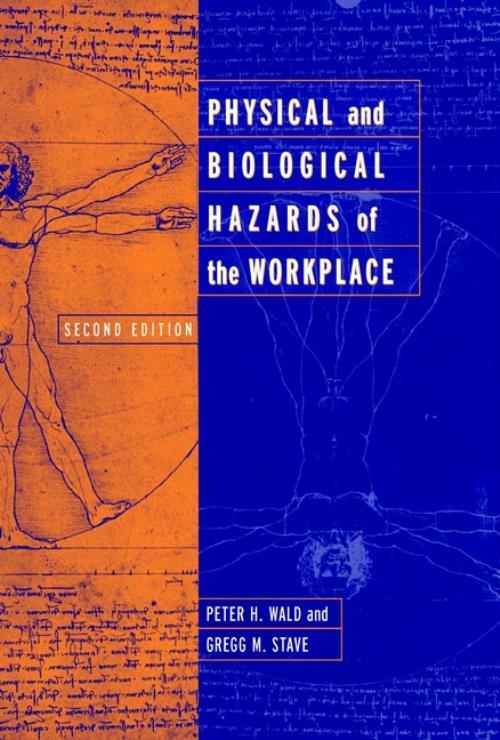 The first award–winning edition of Peter Wald and Gregg Stave′s Physical and Biological Hazards of the Workplace has become one of the leading references for the practice of occupational and environmental health. During the seven years since the landmark first edition appeared, there have been major revisions of government standards and guidelines for physical agents such as ergonomics, shift work, and electric power, and for biological agents such as tuberculosis and blood–borne pathogens. Now extensively updated and expanded, this book continues to be a practical "how to" reference for health and safety professionals. The text is logically organized for quick reference, with separate sections devoted to physical and biological hazards. Introductory chapters furnish an overview of each broad class of workplace hazard, followed by detailed entries describing specific causes, agents, and organisms. All recognized sources of physical hazards are discussed, including ergonomic hazards; dangers associated with shift work; extremes of temperature and atmospheric pressure; energy hazards including noise, electricity, infrared and ultraviolet light, lasers, magnetic fields, and microwave and RF exposure; and ionizing radiation. Biological agents are covered in equal depth, from the fundamentals of microbiology and infectious disease to the specific details of organic hazards like wood dust and endotoxins–plus viruses, bacteria, fungi, parasites, envenomations, and more. The latest research and pharmaceutical technologies and their attendant risks are considered, including recombinant organisms, prions, and malignant cells. The contributors include many of the nation′s leading authorities in occupational and environmental medicine. Drs. Wald and Stave won the Jean Spencer Felton Award for scientific writing in 1995 from the Western Occupational and Environmental Medicine Association for the first edition of Physical and Biological Hazards of the Workplace. The first edition is also on the Core Recommended Reading List from the American College of Occupational and Environmental Medicine. With a foreword by Dr. James P. Hughes and extensive references to the broader body of professional literature, this is an indispensable first source of information and guidance for both primary care professionals and occupational health and industrial hygiene specialists. No other single reference addresses the full spectrum of physical and biological workplace hazards. Physical and Biological Hazards of the Workplace covers the subject with unparalleled clarity, precision, and authority. Introduction to Physical Hazards (P. Wald). Ergonomics and Upper Extremity Musculoskeletal Disorders (T. Hales). Manual Materials Handling (T. Waters). Occupational Vibration Exposure (D. Wilder, et al.). Section II: The Physical Work Environment. Low–Pressure and High–altitude Environments (P. Merchant). Section III: Energy and Electromagnetic Radiation. Ionizing Radiation (B. Breitenstein & J. Seward). Ultraviolet Radiation (J. Hathaway & D. Sliney). Visible Light and Infrared Radiation (J. Hathaway & D. Sliney). Laser Radiation (J. Hathaway & D. Sliney). Microwave, Radiofrequency and Extremely Low–Frequency Energy (R. Cohen). Electric Power and Electrical Injuries (J. Jones). General Principles of Microbiology and Infectious Disease (J. Tulis & W. Stopford). Clinical Recognition of Occupational Exposure and Health Consequences (G. Greenberg & G. Stave). Prevention of Illness from Biological Hazards (L. Frazier, et al.). Bacteria (C. Martin & J. Meyer). Fungi (C. Glazer and C. Rose). Rickettsia and Chlamydia (D. Darcey & R. Langley). Envenomations (J. Palmier & C. Palmier). Latex (C. Goodno & C. Epling). Recombinant Organisms (J. Herstein, et al.). Prions: Creutzfeldt–Jakob Disease (CJD) and Related Transmissible Spongiform Encephalopathies (TSE) (D. Darcey). Endotoxins (B. Boehlich & R. Jacobs).